8 August 2018, at 12:00a.m. Due to the ongoing hot temperatures, the quantities of pigs mature for slaughter are kept on a low level, so acting as a counterbalance to the recession on the meat market. Contrary to previous years, the heat is currently striking the central and northern European countries, thus shortening the quantities of live animals on offer. The fall in prices has reduced with the German leading quotation, after Toennies and Vion had exerted massive pressure. Despite contrary claims, the quotation went down by no more than 2 cents. In both Belgium and Austria, the quotations also went down by much the same amount. From Austria it has been reported that the market is almost dry; a result of the less than substandard quantities on offer than to the meat sales. Wurstsalat is the first choice currently rather than the barbecue chop. In the South, holidaymakers are still boosting demand. With its quotation remaining unchanged, Spain still leads the price structure of the five EU member countries most significant in pig keeping. The pigs-for-slaughter prices are reported to have remained unchanged from France, Denmark and Great Britain as well. 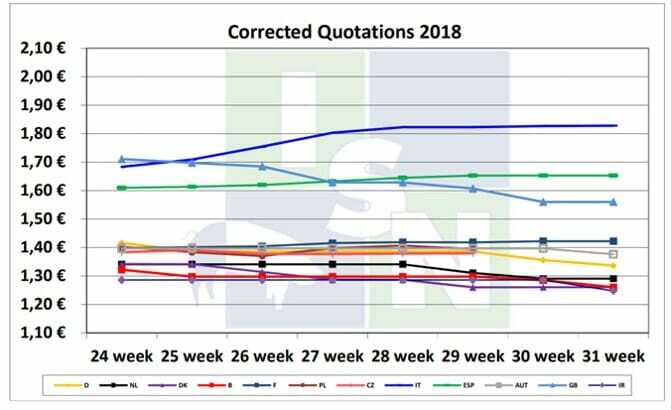 The Dutch quotation is again standing its ground after last week’s price decrease. The market development is increasingly determined by hot temperatures. At present, there is no hope for more ambient weather to come so the quantities of live animals on offer are expected to continue to decrease. According to the marketers, low supply matches slow demand on the part of the slaughter companies. Therefore, the market situation may be assumed to be stable. 1) corrected quotation: The official Quotations of the different countries are corrected, so that each quotation has the same base (conditions). 2) These quotations are based on the correction formulas applied since 01.08.2010.